AS if the Star young guns' onslaught wasn't enough, Rafi Reavis, who turns 40 this July, caught a baseball pass from the backcourt then scored on a breakway layup as he caught the Globalport defense napping with the outcome all but decided. That summed up the Hotshots' second half as they coasted to a 103-77 win over the Batang Pier on Saturday for a second straight win in the PBA Commissioner's Cup. Jio Jalalon led the youth movement as the rookie playmaker provided the most support to import Tony Mitchell as the Hotshots broke away from a tight first half to keep the Batang Pier winless after two games. Jalalon scattered 15 points, including two on a bank shot off a highlight fake-off move on Globalport import Sean Williams, on top of six boards, two assists, and two steals in just 22 minutes off the bench. Fellow guards PJ Simon, Justin Melton, and Mark Barroca also thrived in coach Chito Victolero's fast-paced style of play. Mitchell energized the Hotshots with his rim-rattling slams as he finished with a game-high 22 points along with 17 boards, two assists, two blocks, ane one steal. 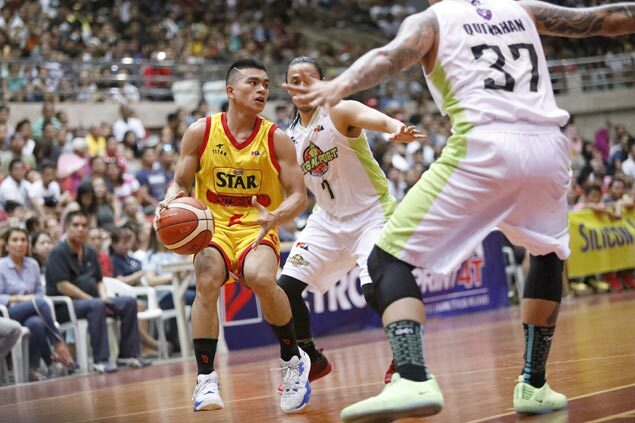 The result spoiled the return of Terrence Romeo, who was sluggish after being out with an illness as he registered 13 points on 5-of-18 shooting and committed seven turnovers although he dished out eight assists and grabbed seven boards in 35 minutes. Williams stayed out of foul trouble this time to contribute 20 points and 14 boards for Globalport.